If you've lost teeth due to accident, injury, or gum disease, we can create a permanent bridge to replace your lost tooth or teeth. A bridge not only fills the gap, but it also prevents repositioning of remaining teeth. A bridge can also correct a misaligned bite, improve chewing function and speech articulation, and provides an internal structure for the face to give you a more youthful appearance. 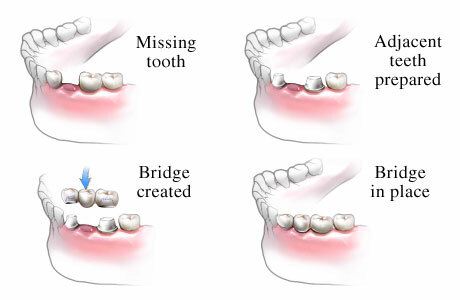 A bridge is a prosthetic tooth (or teeth) that attaches on one or both sides to teeth prepared with dental crowns. A fixed bridge is permanently joined onto the neighboring abutment teeth (crowned teeth) and consists of three basic units: the false tooth or teeth (called a pontic) and two abutment crowns. The style of bridge we suggest will depend upon the strength and health of the abutment teeth and the location of the gap in relation to the rest of your dentition. If healthy adjacent abutment teeth aren't available, a surgically-implanted metal post, known as a dental implant, may offer a solid alternative. For a bridge that replaces many teeth, we may recommend a removable partial denture or implant-supported prosthesis.